Advanced and reliable backup & recovery software for home office and business users to perform self-service backup with comprehensive full/differential/incremental backup. Full system protection allows you to easily back up and recover your entire operating system when disaster happens. Block-level disk imaging quickly and efficiently backs up the entire disk or volumes. File-level backup allows you to selectively back up specific files, folders or file types, including network shared files. Back up specific files and volumes without interrupting any current operations, especially for open files backup. Only back up changes made since the previous backup, saving time and storage space. Flexible backup scheduler allows backups to run based on daily, weekly, monthly or event. - Affordable yet Powerful - fast, safe and easy backup software with reasonable price, only 50% of the price of competitors. - Easy to Install and Simple to Use - intuitive interface combined with wizard guiding you to perform backup & recovery step-by-step. - Reliable and Secure - back up any crucial data where you want and protect them in a safe way. - Windows 8 Compatible - EaseUS Todo Backup is always Microsoft-ready, supports Windows /108/7/Vista/XP. - Multiple Languages Supported -English, Deutsch, Español, Français, Italiano, Português, Polski, 日本語, 中文 (繁體), 中文 (简体). - System backup - Full system protection allows you to easily back up and recover your entire operating system when disaster happens. - Disk imaging - Block-level disk imaging quickly and efficiently backs up the entire disk or volumes. It can speed up the backup process of large files as it only backs up the modified blocks of data instead of the entire file. - File backup - File-level backup allows you to selectively back up specific files, folders or file types, including network shared files. - Hot backup - Integrate with Microsoft Volume Shadow (VSS) to back up files that are in use, back up specific files and volumes without interrupting any current operations, especially for open files backup. - Outlook Email backup - Back up all emails in Outlook Express or 2003/2007/2010 and save them in a safe way. - Sector-by-sector backup - Store an exact copy of your disk or volume, including unused space, sector-by-sector backup assures you a 100% identical copy to the original. - Full backup - Only a full backup allows you to restore the exact configuration of your PC, including your operating system, applications and all your files. - Incremental backup - Only back up changes made since the last backup, significantly reducing backup time and storage space. - Differential backup - Only back up changes made since the last full backup, saving time and storage space. - Schedule backup - Flexible backup scheduler allows backups to run based on daily/weekly/monthly, or to be triggered by specific events (users logging in or out, system startup or shutdown). - Unattended backup - Runs as a Windows service - ideal for unattended workstations. Backs up even when system logged out, slept or hibernated. 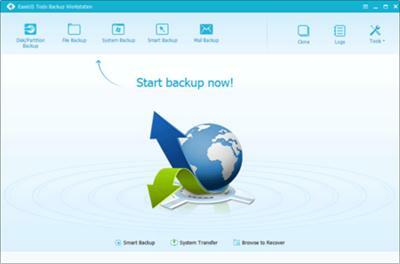 free download EaseUS Todo Backup Workstation 9.0.0.1 Multilingual.EaseUS Todo Backup Workstation 9.0.0.1 Multilingual full from nitroflare rapidgator uploaded turbobit extabit ryushare openload littlebyte zippyshare.